Wendy Ramshaw is a leading and internationally renowned artist jeweller, who never ceases to experiment with a diverse range of materials and new technologies. Artistically she was always ahead of her time, her designs are distinctive and innovative. In 1978, Wendy Ramshaw and David Watkins became Artists in Residence at the Western Australian Institute of Technology in Perth (now Curtin University) sponsored by the Australian Crafts Council. It was during this period that Ramshaw began working with clay and soon recognized the surface qualities of ceramics in combination with metal. In the 1980s Wendy Ramshaw, in a continual search for new materials, collaborated with Josiah Wedgwood & Co. of Barlaston, Stoke on Trent, to produce a collection in black basalt and white jasperware stoneware, their traditional wares. The ceramic pieces were made by Wedgwood and then carved and turned in the artist's London studio. The resulting ceramic elements were then assembled into pieces of jewellery using 18 carat yellow gold. Some pieces were limited editions, others unique. The collection was launched in 1982 with a show and catalogue at the Victoria and Albert Museum. 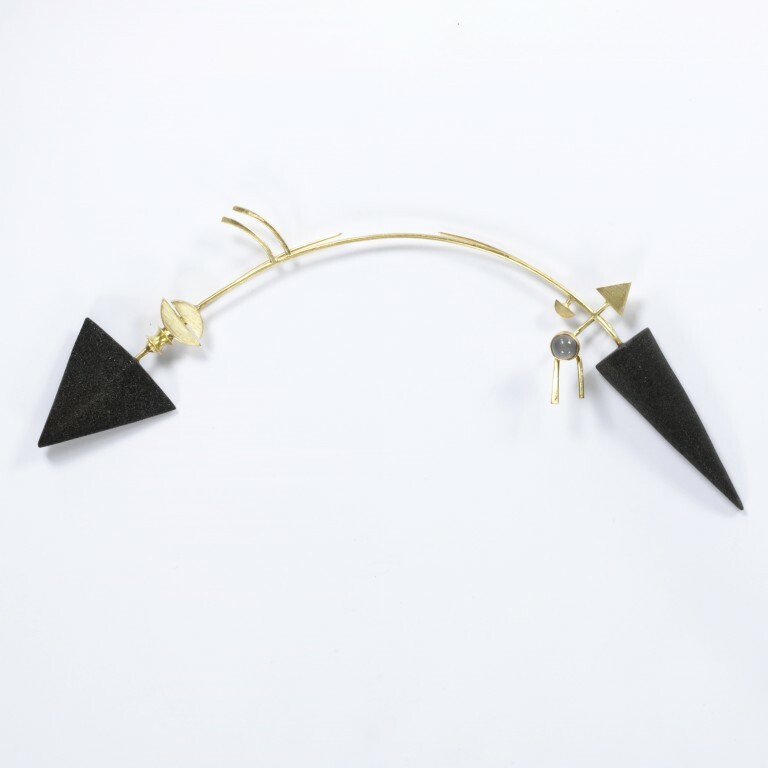 The curved pins with their basic triangular-shaped heads as ornaments, are reminiscent of arrowheads and may go back to Ramshaw’s fascination for Aboriginal art when she was in Australia. Exhibited in the Wendy Ramshaw exhibition which marked the reopening of the Jewellery Gallery in October 1982.